A native of San Diego, California, Jenny Shin is a rising artist of the current generation whose playing has enjoyed critical acclaim. 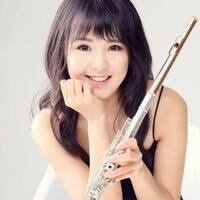 She has garnered top performance prizes from numerous competitions, including the National Crescendo Awards, Yamaha Young Performing Artist, Musical Merit of California, Illinois Flute Society, and San Diego Flute Guild. Recent public engagements include a solo recital given as the winner of the 2016 Krannert Debut Artist Competition and performances at the 2012 Music for All Summer Symposium at Ball State University. In addition, she has performed throughout the Midwest in venues ranging from the Chicago Cultural Center, to Copley Symphony Hall, to the Krannert Center of Performing Arts. Ms. Shin received her bachelor's degree from University of Illinois at Urbana-Champaign and her master's degree from Northwestern University. She is currently a doctoral candidate at the University of Illinois. Her primary teachers include Jonathan Keeble and John Thorne. In addition to her thriving career as a performing artist, Shin is a passionate teacher. She has been a part of the faculty with the Illinois Summer Youth Music Pre-College Flute Camp since 2014 and has served as teaching assistant at both the University of Illinois and Northwestern University.